How many epithets and eloquent phrases associate St. Petersburg with the sea, for example, "The maritime Capital of Russia", "The Aquatic Gate". St. Petersburg stands on not only on the shore of the Finnish Gulf (which is part of the Baltic Sea), but also in the delta of the Neva, which disintegrates into several branches in the city. Besides several channels have been created, which perform not only practical tasks, but also adorn the city. Of course, such amount of water cannot dispense without ships of various assignment. In St. Petersburg there are two river stations (the second one was built because of the excessive congestion of the existed one), two maritime stations - the old maritime station near Lenexpo is now transformed into a business center and a hotel. The new station is able to receive the largest marine liners that only exist and it is a part of new onshore territory "Marine Facade". 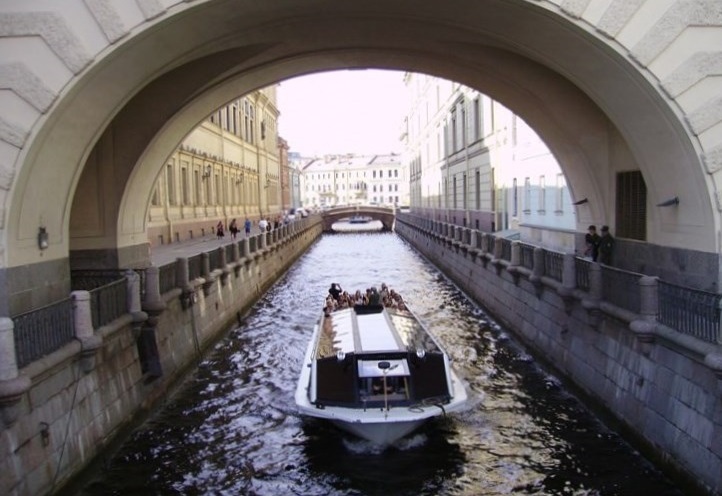 Not only children, but experienced rivermen and sailors will be interested not only in the sights of the Northern Capital, but also in the ships in St. Petersburg. We can distinguish several groups of ships that can be seen in the center of the Northern Venice. Pleasure boats in St. Petersburg, which are in a great amount. They furrow the Neva and almost all small rivers.Watch the video. They ride tourists and are used for corporate events. On the small rivers (Fontanka, Moika, Griboedov Canal etc.) small ships with one deck are used. 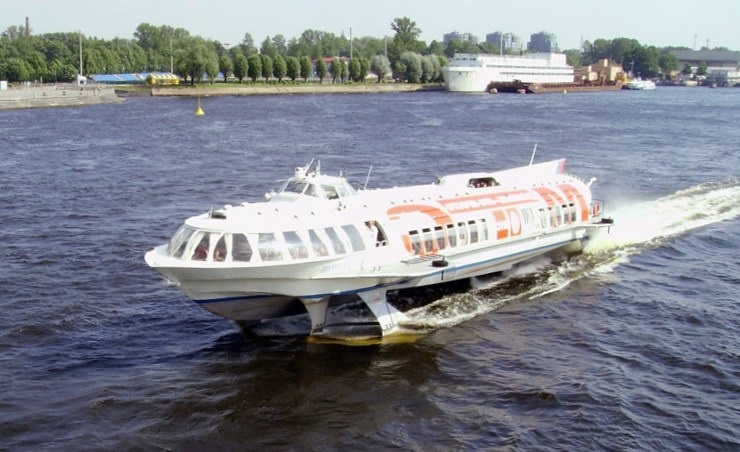 The most common type of vessels are the Fontanka type, which have a closed deck with glass windows and a roof as well as an open part on which tourists can be remain in good weather. There is also a great amount of small ships of individual projects. 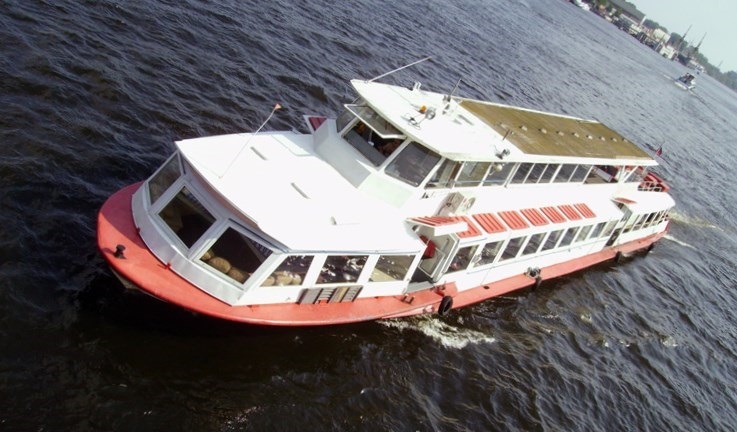 On the Neva mainly are plying motor ships of the "Moscow" type that have two decks: the upper is usually open for good weather, the lower one for bad weather.Due to the relatively large size, such ships are used as floating restaurants. Meteors are hydrofoil ships. Unlike the ordinary vessels, these vessels have a submarine wing that allows lifting the hull of the vessel out of the water, so that the resistance to movement is significantly reduced and the ship can move at the speed of 60 km/h. You can see the meteors which are moving at full speed on the Birzhevoy and Tuchkov bridge.Watch the video. Under these bridges, meteors sail at maximum speed and everybody may observe this performance from above. You can ride a meteor at Peterhof (most of the voyages), as well as to Valaam and Petrokrepost. Cargo ships. Large cargo ships of the river-sea class can be seen in St. Petersburg at night during the raising of the bridges. The ships sail especially close to the shore through the fold of the Troitsky and Liteiny Bridge. In the diurnal time the navigation of cargo ships is practically absent because of brought together bridges, only special low ships such as "Nevsky" can sail under the bridges. But hardly their sight will interest you because they transfer loose building materials, namely sand and etc. The ships which are waiting for the raising of the bridges can be seen on the quay of Lieutenant Schmidt. Sea cruise liners amaze the imagination of provincial tourists. They stop not only at the Marine Station, but also in the city center - at the English quay and the Lieutenant Schmidt quay. From the Bronze Horseman or St. Isaac's Cathedral to the sea ​​liners it can be reached in 10 minutes. On the quay of Lieutenant Schmidt and the English quay ships stop in the length to 200 meters. Very large ships stop at the special Marine Station now, which is located on the embankment, quite far from the metro station "Primorskaya". Naval parade. 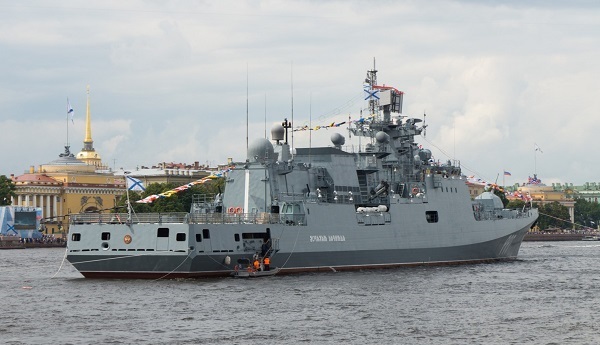 On the day of the Russian Navy, a parade of warships is held annually in the water area of ​​the Neva. But these ships are located in the city center usually much longer - several days before and after the solemn date. 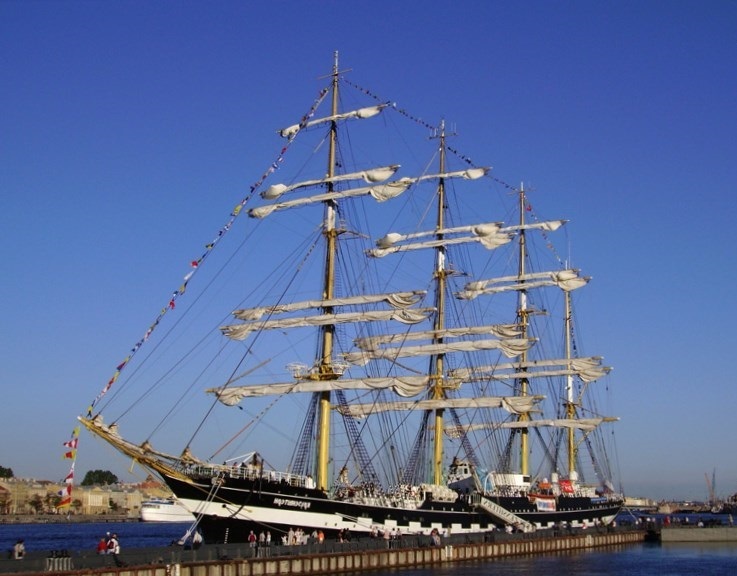 Ships-museums.In St. Petersburg there are several ships, standing "on eternal bracing". Of course the most famous floating museum is the cruiser Aurora. The entrance to this symbol of communism is free, in accordance with ideology. You only have to pay for the tour if you want. It is worth noting that the hull of this Aurora rusts somewhere in the port of Lomonosov and local residents like to point out this place. But in the museum there is a lot of genuine, so it's worth to take a walk on the Aurora. One more famous "dinosaur" of Soviet times is the icebreaker "Krasin" which stands at the end of the quay of Lieutenant Schmidt. Like Aurora, it cannot move around solely, but there is much more genuine on him. On the same quay, among enemy cruise ships modestly stands the museum "Submarine S-189". If you have a lot of time or you are an ardent fan of marine ships, I recommend visiting the Kanonersky Island. Kanonersky Island is partially natural and partly man-made pier for the seaport of St. Petersburg. Here you can observe the work of the cargo port or simply take a walk along the shore of the Finnish Gulf. Summing up, we can recommend to all amateurs of ship theme during your visit to stroll along the quay of Lieutenant Schmidt. Such ships in St. Petersburg can be seen here. Freight ships of the river-sea class are going up the Neva and awaiting the raising of bridges. Cruise liners are located closer to the Annunciation Bridge. From June to August almost every day there are 2-3 snow-white handsome liners which leave from Great Britain or Denmark and St. Petersburg is the final point of the route for them. 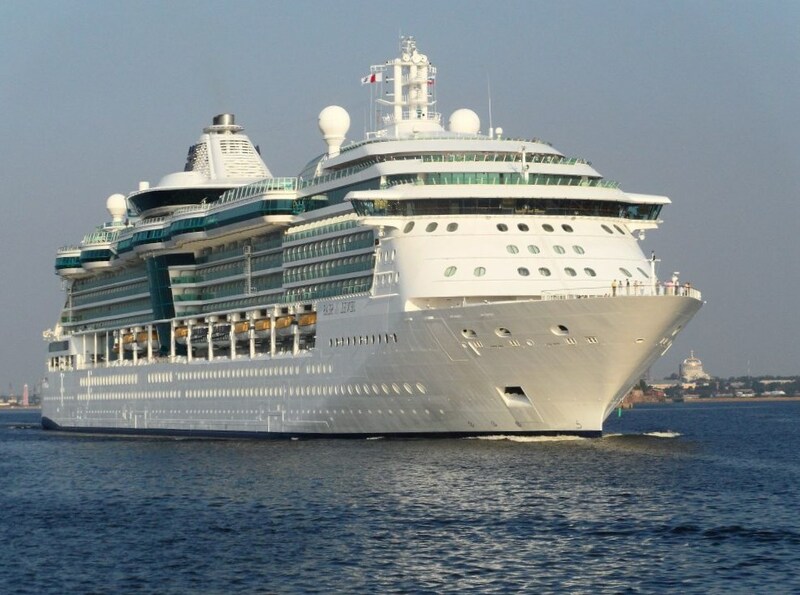 The most frequent ships are meeting from such companies as Pullmantour, NCL, Silversea, Azamara Cruises.